Here is a page of old friends, ones we nurtured, set up for the world and and sent on their travels, and some who have left us, whose memories we hold dear. 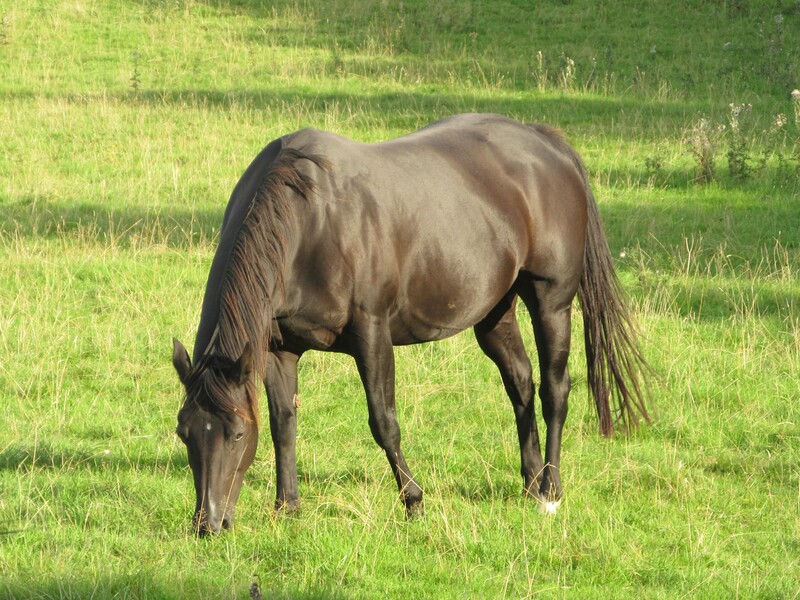 To find pictures of our home-bred foals by Rival, look on the Stallion page. 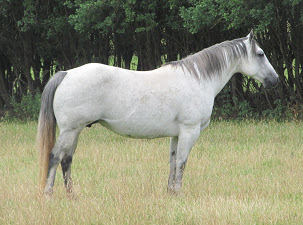 Super homebred mare, She bred us a filly by Cowboy who has been retained - she has now gone on to start a ridden career and doing very well..
Lovely, gentle, grey (bay roan) mare, good temperament, super conformation and moves well. She has truly World class cutting breeding on her sire's side and her mother is half-sister to NFR Reserve World Champion Heeler, MP Thriftwood. AQHA tested 5-panel negative. In 2017 we made the very difficult decision to sell Deena, who now lives in Hungary. Her genetics are retained here through her superb son, Wilden Shogun.. Her pedigree reads like a who's who of AQHA Best Remuda awards, she is easygoing but very fast on her feet and athletic. She combines build like a brick outhouse with unquestionable quality put in there by breeding programmes that go back a hundred years and more. AQHA tested 5-panel negative. Two of her daughters have been retained for now, one by War Chiefs Pride and one by Rowley Late Arrival, and she herself has gone to join her best buddy Suki in Germany. 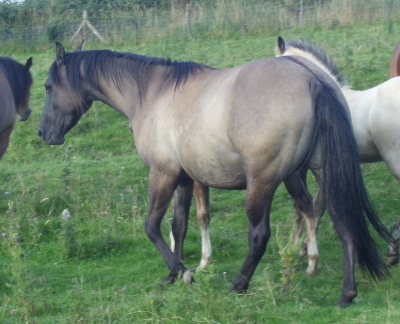 'Suki' is a big red dun tank of a mare, very genuine, long hip, the most fantastic legs and feet and has awesome action. Out of a favourite broodmare who worked livestock with Sue George at Rockfields. AQHA tested 5-panel negative. Suki produced is a super filly by Cowboy who has been retained. She now lives in Germany. To see more details of the horses that make up her pedigree, click here. Mo is a gorgeous Quarter horse mare by Ober Star Diamond. 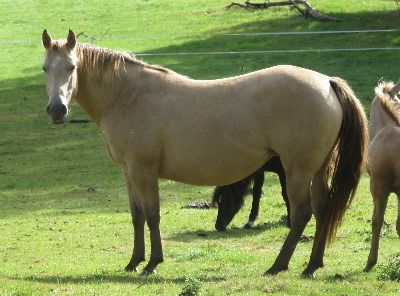 Her unusual colour is amber champagne. She is everything we hoped she would be, straight and correct with a super temperament and a good mum. She is AQHA tested 5-panel negative. Her foals to date have been stunning. In Autumn 2015 we made the very difficult decision to sell Mo in order to keep her son by War Chiefs Pride as our herd sire. To see more about the horses that make up his pedigree, click here. 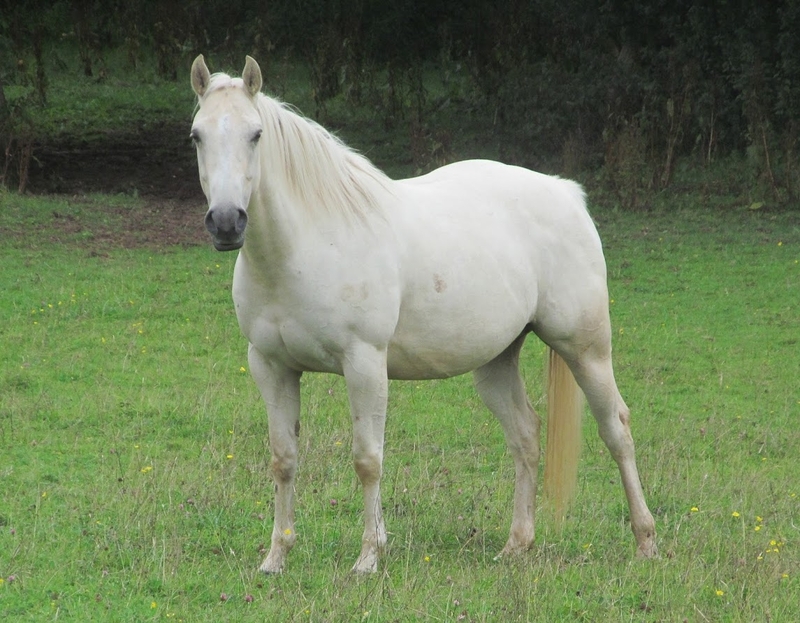 Rival is a purebred, AQHA registered cremello quarter horse standing 15.2hh. 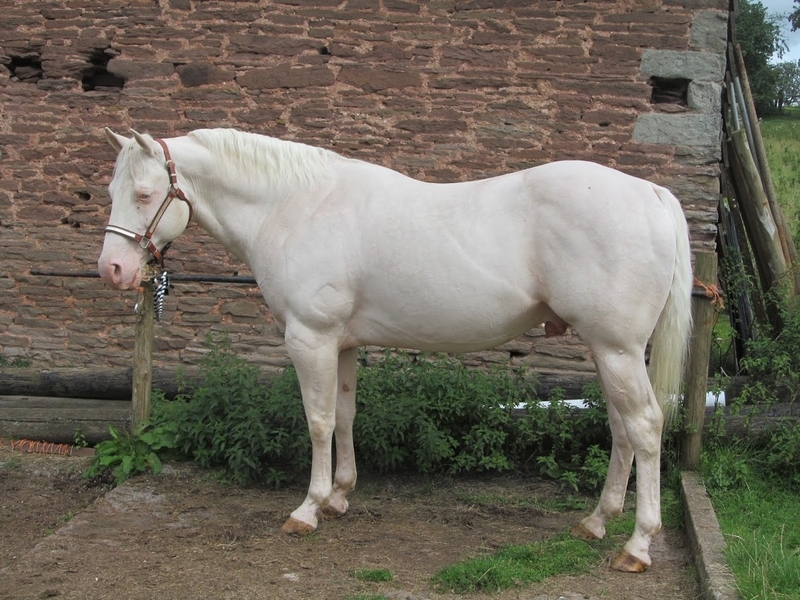 He is a super looking horse with a long smooth stride which is very easy to ride. 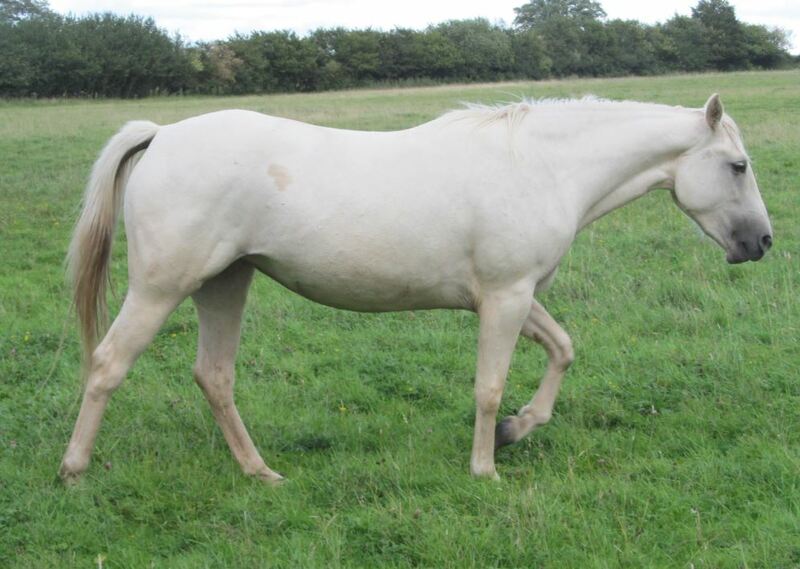 Rival is blessed with a calm, gentle temperament which he has passed to all his foals. We bought him as a weanling in 2006 and retained breeding stock from him, selling him in 2015 to make way for Wilden Cowboyclassic. AQHA panel tested,negative for everything. We brought in this filly, our second by Ober Star Diamond to bring on as a broodmare and riding horse. She is a half-sister of Rival on her mother's side. Bisquit Chick is an outstanding mare and in view of her age we thought chances of buying a filly from her would be running out. Cracker looked a super foal and she hasn't disappointed; she has lovely conformation and a genuine, sensitive temperament, she is tremendously fast and can stop on a dime. 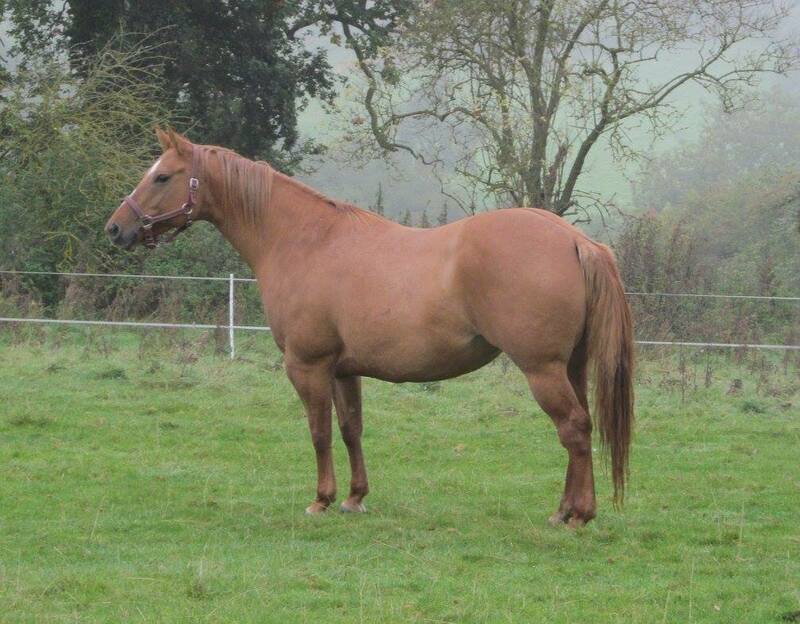 Esee is a very lovely gentle foundation-bred broodmare who we sold in-foal.